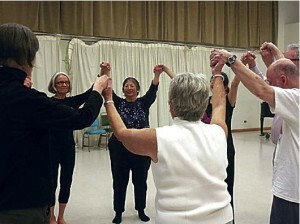 Krannert Center for the Performing Arts offers monthly dance classes to people with Parkinson’s in the Champaign-Urbana area. Dance instructors Kate Kuper and Marianne Jarvi offer what some call a ‘support group’; stretching, simple dance moves, uplifting music and socialization among those experiencing similar difficulties. The classes are free, and open to anyone with Parkinson’s, or those over 50 with flexibility, balance and mobility issues. View the full class schedule and learn more about the program at the Krannert Center website.